Visitors are more than welcome at Builth Wells Golf Club throughout the week. You will receive a typically warm welcome from the Pro Shop to the Clubhouse and we at Builth Wells Golf Club guarantee you will enjoy your day and will want to return. As a group of very satisfied visitors commented "from the time we arrived to the time we were leaving the whole experience at Builth Wells Golf Club is one not to be missed”. Where many courses do not allow visitors on weekends we are more than happy to accommodate visiting golfers & societies albeit with restricted tee time availability. Buggies are available for hire at £18.00 per round, electric trolley's at £7.50 per round and pull trolley's at £2.00 per round. Alongside that course planners are available to plot your way round the golf course for only £3.00. Builth Wells Golf Club is most definitely the Jewel in the Crown of Welsh golf courses, once played never forgotten. The dress code is designed to maintain standards that the club members have agreed upon for themselves, guests/visitors. Unless otherwise stated, the code relates to the clubhouse and course. To view the current Builth Wells Golf Club scorecard, please click on the link. Any player deemed to have an non competitive handicap can enter open events but are not eligible to win any prizes. 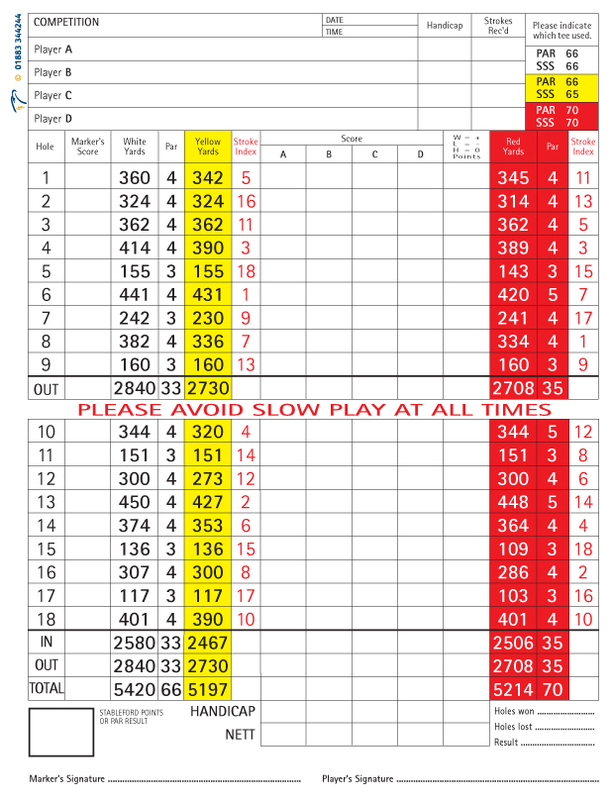 The card can be used to help get the handicap back to a 'c' status. All green fees should be paid in the Professional’s Shop before commencing play. Should the Professional’s Shop be closed payment can be made in the Clubhouse. Glynhir Golf Club and Herefordshire Golf Club members pay £10.00 green fee on production of proof of full membership (weekday) and £15.00 weekend (Herefordshire Golf Club) on production of proof of full membership.